Well, this meal is slow, and that’s a good thing. It’s the kind of thing you throw together in the early afternoon, and eat with little to no prep at night. The one thing I’d recommend…don’t switch to a leaner form of chicken. I tried this with chicken breast, thinking, I’m gonna cut out half the fat because I know better! The chicken was so dry, it was like chewing twine. Thomas looked at me like, Really? So I scrapped that plan and tried chicken thighs. Way, way, way better. While most of the time cutting out as much fat as you can is the thing to do, it’s not with this recipe. At least not with the chicken. However, there is no added fat, and you’re using skinless chicken, so nutritionally, you’re still doing pretty good. Actually, I think you can safely say that most chicken recipes that involve slow cookers call for dark meat for a reason. The fat helps the chicken stay moist, even when you’re cooking it in liquid. I know I’ve used chicken breast in slow cooker recipes and it wasn’t a disaster, but if I remember correctly, the chicken wasn’t the main ingredient, and it was always a little dry. I’d recommend serving this with a starch side, such as Mexican rice. I like to use Uncle Ben’s Ready Rice because it takes 90 seconds to heat up in the microwave. That way, when I’m ready to eat, I throw the rice in the microwave, dish up the chicken from the slow cooker, and done! 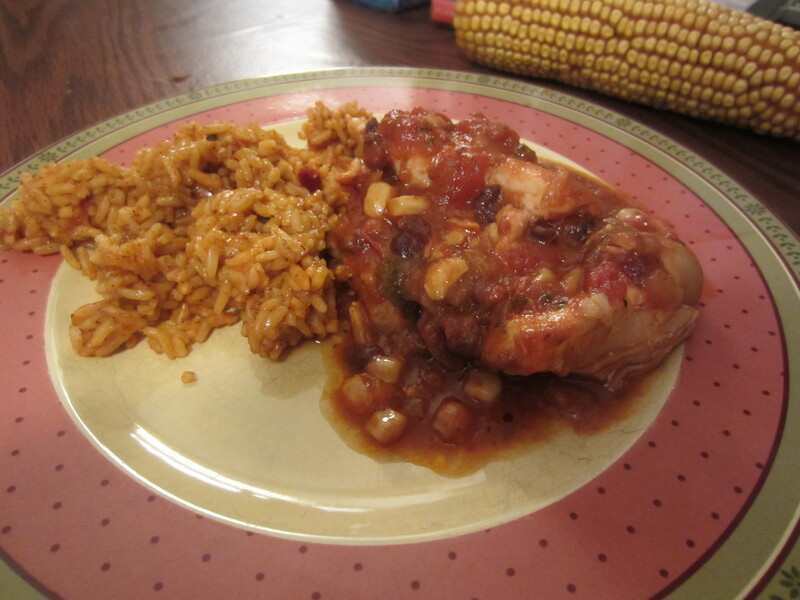 Put chicken in the slow cooker pot and pour salsa on top. Cook for 3 to 3½ hours on high, or 6 to 7 hours on low. I kid you not. That’s it. 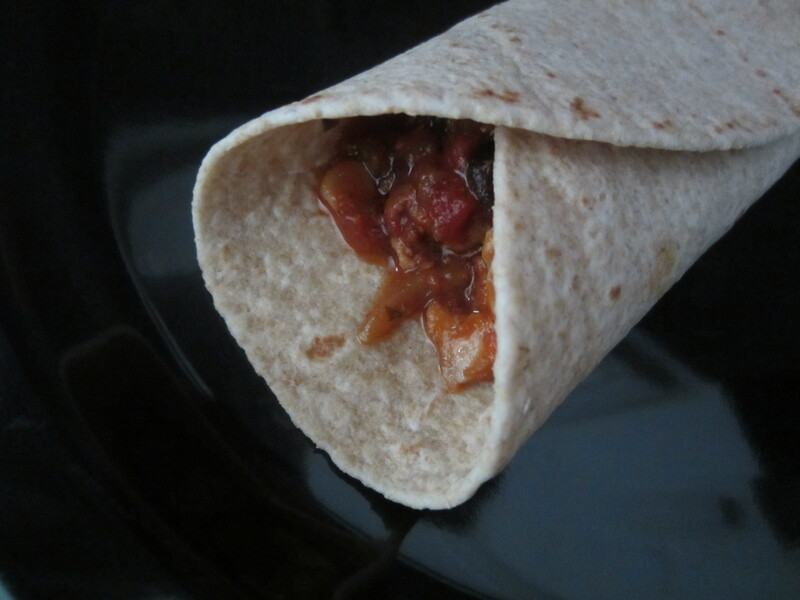 The leftovers are great the next day for lunch – just tear up the chicken and serve in a whole wheat tortilla. Jenny Craig: Add 2 Starch (at about 80 calories each) and you’re set for dinner. Weight Watchers: 4 Points (using calculatorcat.com).